A 1000x oil immersion objective is nice to have, but the range of applications are limited. The total magnification of the microscope is calculated by multiplying the magnification of the objectives, with the magnification of the eyepiece (which is usually 10x). This range covers most specimens quite well. In most cases you do not need more than 400x. The maximum theoretical useful magnification which is possible with compound microscopes is 1000x. This magnification already requires a very steady and solid device. Forget about advertised values such 1200x. Meaningful magnifications of 1000x are already difficult to achieve (requiring a 100x oil objective) and anything above it will be useless empty magnification, because the resolution limit of the microscope has already been reached. If you want a stereo microscope, then you will, most likely, go for a magnification from 10x to maximum about 70x. Now, how much magnification do you need to observe various specimens? Not as much as you might have guessed. 40x: The low magnification is useful for focusing and centering the specimen. Many specimen samples can be seen completely and the low magnification allows you to orient yourself. Larger cells can be seen clearly, but the more intricate details remain invisible. 100x: Bacteria are now visible as small dots. Details of the specimen now start to appear. The depth of field is still comparatively large, so it still might be possible to see the whole specimen in focus. 400x: This magnification is useful for looking inside cells. If you have prepared slides of cell divisions, then you are able to see the individual chromosomes quite well. The depth of field is now small and you have to operate the fine focus knob continuously. The shape of bacteria is now clearly visible. 1000x: This magnification is only useful if you have a solid and stable device. You need immersion oil to achieve the best resolution. Bacteria can now seen quite well, as well as other details of cells. Instead of a 100x oil objective, you might consider to buy a 60x air objective, which keeps your slides clean (you do not need to put immersion oil on the slide). 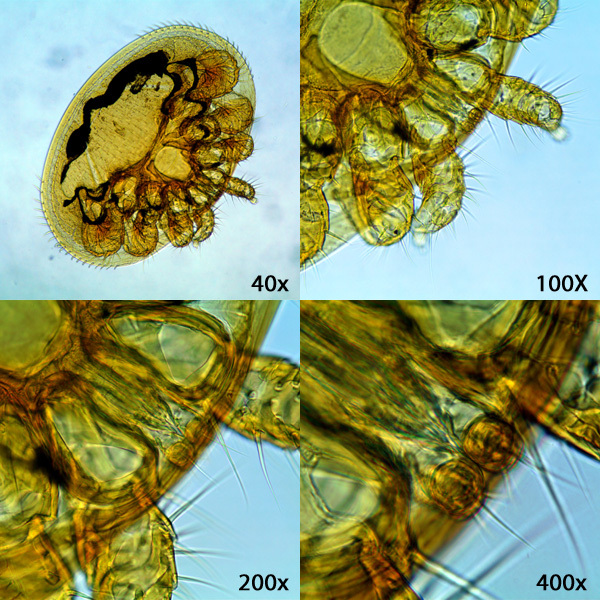 The image shows the Varroa mite at different magnifications.